Something else, as to why Poser 9 and Poser Pro 2012 is required. Previous versions of Poser do not support any kind of weight mapping. Genesis is weight mapped. I got M5 and V5 on a disc from 3D Artist magazine. Is there something that I need to do to get them updated? that's all I got on the disc I think. I bought the Evolution morphs bundle here, and other things. You may need to send in an support ticket so they can put the pack in your account etc (may have to show proof of purchase of that magazine (though not positive what they will ask for exactly) but I am fairly certain in the past that support has managed it so you could get the updates etc if you contact them. What department should I select for this? Sales? I downloaded and installed DSON..it imports just fine, but the problem I am having is when you go to switch to different catagory..IE material, pose, etc. It will not load that libary it just sticks in the figures. is there a fix to this? Which version of Poser? Also, are you switching back to your Poser Runtime Library or staying in the ones that came with this? If you aren't switching to your Poser one, could it be there isn't anything in those folders in the new Runtime? I know I am using Poser Pro 2012 and it is going between my runtime libraries fine but I dont have Poser 9 just 2012 Pro so I cant check the other. I know its working fine in 2012 though. Also could it possibly be lagging a little maybe? Yes, M5 and V5 are not included in the Genesis Starter Essentials. The base Genesis has a male, a female, and a kid none of them are M5 or M4 or V5 or V4 or any of the others you need the shapes for Genesis or in the case of V5 and M5 at least the base characters in order to have the shapes in Genesis. I have poser pro 2012 sp3....i have plenty of stuff in all the runtimes...after you click on any other icon...pose,lights,anything it's like a gaint lagging...and the never loads that area. Surprisingly this all worked first time for me. I installed D|S 4.5.1.6 then Genesis Starter Essentials 1.6 (to the DAZ Content Library) then the DSON Importer and companion files. I'm using PP 2012 SR3 64 Bit on Windows 7. I already had MS Visual C++ 2010 installed, so had the runtimes mentioned in a previous post. Genesis imports fine into PP 2012 and renders. Well done, DAZ. I'm speechless. Now, a question. Although it wasn't my intention to start re-downloading countless terrabytes of updated content from my unsearchable previous orders list, I did try a reset on Michael 5. Could somebody explain what the difference is between the Legacy and DSON Core files (e.g: "Michael 5 - Legacy - PC" and "Michael 5 - DSON Core - PC"). Do I have to install both? Do they both go to the DAZ Studio Content Library? I would have expected just an updated Michael 5 installer plus the companion file (Michael 5 - Poser Companion - PC), but this has thrown me and I have no intention of installing any of these files into my perfectly working DAZ Studio configuration until I know what they are and what they will do. The Legacy version is for those using DS 4.0 rather than 4.5 -- you don't need it. It could be this is fine and you aren't in an empty directory, but I have to ask to be sure. If you aren't, then I would say try restarting Poser (or even restarting your computer and then Poser (maybe a RAM thing?) and if that still doesn't work then yes I would say to put in a support ticket. Let them try to help and then they can help determine the issue and whether it needs a bug ticket. I know in 2012 I am moving around fine between the libraries etc. The only lag I experience really is when I load clothing on to Genesis. That is lagging for me...it lags...Genesis disappears... then reappears with the clothing on. But so far that's the only lag I've experienced. I'm looking forward to seeing how this works out (hopefully Daz won't have to call the Orkin Man) though after all the disappointments over the last year I'll take a wait and see position. If I open a figure file in Studio and convert it for export would I then be able to open it in Poser? I ask this since I bought a figure that said it was compatible with poser (of course it wasn't) and isn't on the DSON list. You should -- what is it, and is it in .duf format? where low and behold under compatible 3D software at the bottom of the page it says "DAZ Studio, Poser" - Bob Barker buzzer here. I've noticed quite a few other products with this "error" (This new site has to be one of DAZ's worst screw-ups to date aside from the new coupon system). I still hold the position that Daz could/should let or encourage content providers make available the same products in a Studio and a Poser format - and while I've been informed that it would take extra work - think of all the problems with annoyed, angry, and former customers that could have been avoided - but maybe this might work. I still have a few months to decide if I want to continue with my membership. This is a BIT of an incentive - it just depends if this converter is simple and reliable OR a complete pain which works but requires too much time or effort. While I love the idea I'm going to treat it like a new version of windows - maybe wait a couple of weeks to see what interesting complications none of the programmers foresaw turn up or the usual user manual tweaks. BTW is there any way to correct my info? I'm certainly NOT a new member who joined at "0" which if you thought about it would make me the longest standing member in the world (had the internet existed when Christ was born). Well, here is my render of Genesis in Poser 9. Now if I can figure out how to put a background and some type of flooring. But one kind request for DAZ. What can I say but many, many thanks to all who made this possible. The Daz interface is just not as intuitive as Poser's for me. I know it is for others. I have already made a modest investment in Genesis content. This makes it worth it. And thank you for making the interface free. Now, I see some neat items in the Platinum Club sale. Probably just a coincidence ;-). I have stuck with you through your tribulations. I hope things go better now. Glad I had faith in you, and thanks for your efforts for the Poser community. Now to the sale. Just a quick render. "Poser and Genesis. Together at Last". Thanks again to all involved. ERROR: DLL load failed: %1 is not a valid Win32 application. Plus, I’ve installed the Starter content, but there’s nothing new in my library yet. Any ideas? I’m looking forward to toying around with Genesis in Poser! After installing the Microsoft downloads above (both of them) the "mainWacro" window errors stopped for me. 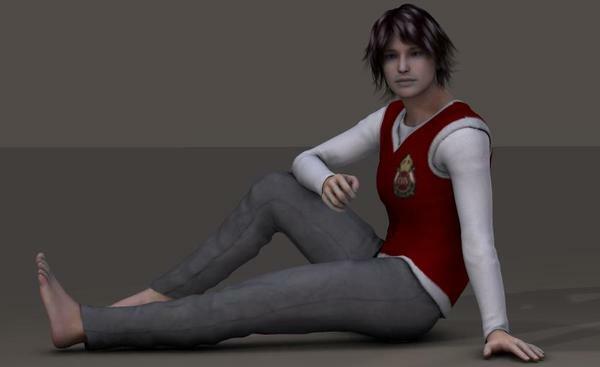 If I buy the H3, A3, V3 and M3 shapes for Genesis and use the DSON utiltiy inside Poser Pro 2012, will I be able to use their conforming clothes for them in Poser ? Been playing a bit more, and keep getting more and more impressed. Just openened an "old" scene with genesis in DAZ Studio (shape/ clothes etc) and then did export for a companion file for the entire scene. The scene was almost flawless imported in Poser including content that has no DSON file and auto fitted clothes. Both DAZ and Smith Micro, many many thanks for this great tool! Those of us who've bought a bunch of Genesis content, on the hopes that a day like this would come, do we have to reset our downloads and redownload everything? Also I don't see gorilla in the list of DSON comapatable figures, or the products from the Battle Ready bundle for Genesis, Leigon, Praetorian, Percy, and Heracles all for Genesis of course. Will these be updated in a timely fashion? edit to add: Forgot to ask, can we install our genesis based content in a directory other than the default Poser runtime? 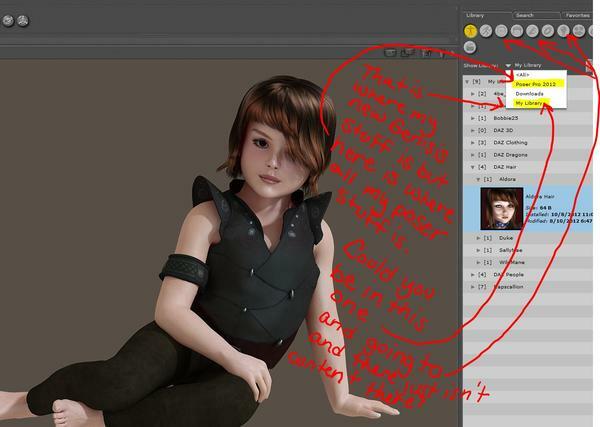 Q: If I’ve created my own content in DAZ Studio 4.5 can I make it ready for use in Poser? You should be able to convert anything for Genesis using DS 4.5.1.6 yourself without having to wait. Though I do understand that not everyone wants to use DS4 if they dont want to. But the option is there. I don't suppose the importer will work with Poser Debut? is the dson importer some converter of weightmapping between daz and poser? or what else does it exactly do? are there still features that are different? will there be dson importers to other packages like C4D, LW, Max,....? I have seen the development of a maya plugin, seems all the news of future developing about it is gone. Is the daz official content downloader ready? how do we now, what files we need to update? I'm confused about this, because apparently there exist several old unofficial downloaders. Will there be a way to get updated V5 files for those of us with the 3d World Disc? And a huge Thank you for this. As Matty says, if you can run DS4.5 you can do your own conversion. If not you will need to open a support ticket (with Sales) but I'm not sure what the policy on updates will be.